We are in the business of working with clients to enhance theirs, by creating top tier technology to deliver world class campaigns. Our skilled staff are inspired by a genuine enthusiasm for technology. This passion drives our team to perform at the highest standard, developing new and unique experiences that are leading in the industry. For more information, do not hesitate to contact us. We are eager to hear your ideas and discuss how we can partner with you to accomplish your desired outcome. Captivate your audience with a cutting-edge experience. This immersive technology is sure to draw attention. Generate a targeted database of consumers directly engaged with your brand. Achieve mass-scale consumer engagement through the activation of customised augmented reality technology to promote your brand. Extend your sphere of influence by providing consumers the ability to share intriguing, branded content. Use immersive technology to build new and unique interactive activations. 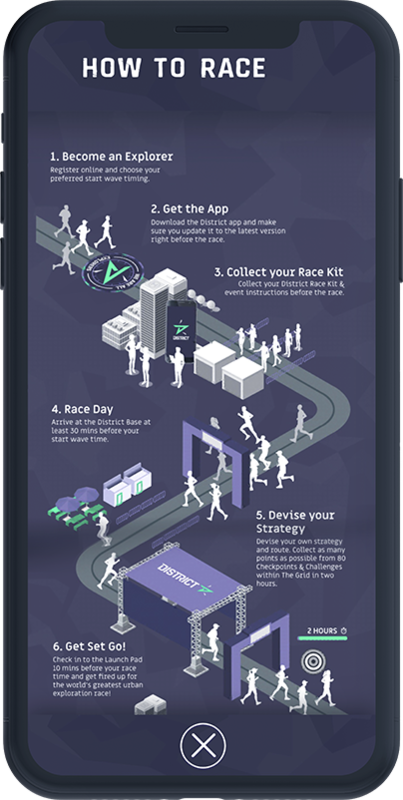 The District app brings cities to life in a 2 hour immersive urban exploration race, with 80 virtual checkpoints and challenges across the city brought to life by cutting edge Augmented Reality and location based technology. There’s no set route and no set distance, its up to you to choose how you explore. Run your city on your terms and level up your fitness. District Technologies brings together Exceed’s vast knowledge & experience hosting mass participation events alongside Lightweave’s experience combining cutting edge technologies to build a never before seen experience. Since launching in early 2018, District has hosted 2 major events throughout Asia, attracting 5000+ participants and sponsorships from big brands including Adidas, AIA, Mastercard and Garmin. Do you need a customised experience? We offer custom development solutions that might be a great fit for your ideas!